Practicing Guitar But Still Not Getting Anywhere? READ EVERY WORD ON THIS PAGE! Want to know why your guitar playing progress is still slow even if you take guitar lessons, practice a lot and have been trying to improve for a long time? Are you tired of seeing other people making faster, better and more significant progress on the guitar than you do? Even though they really have no more 'natural talent' or practice time than you do? Few things are more frustrating than investing so much of your time, your energy and your money into becoming the guitar player you want to become, only to wait 'years' to finally get there. Chances are you are probably standing in your own way of becoming a great guitar player. Most people have more than enough things (licks, techniques, exercises, scales etc.) to practice, but their approach to practicing guitar is often ineffective, inefficient and unorganized. Often times these people blame their slow progress on all kinds of things, when the truth is that they are missing one critical piece to their guitar playing success: a highly effective, customized guitar practice schedule that is personalized to them, and ONLY them, based on their unique skill level, musical challenges, needs and goals. It is not merely your potential, how much you practice and being self disciplined that make the difference between years of struggle and being able to finally play guitar the way you want to play. 1. Guitar practice schedules are too rigid and put limitations on me. False! A guitar practice schedule is a roadmap to freedom of being able to play whatever you want! How? Because if the schedules are goal oriented, highly effective and customized to you, you will overcome the challenges you currently struggle with much faster so that you can play whatever you want fluently, consistently and expressively. The best guitar practice schedules are not rigid nor limit you, in fact they actually free you from limitations. I'll show you the proof in the next few minutes. 2. A guitar practice schedule that worked for somebody else will work for me too. False! The only way that statement could possibly be true, is if you are an exact clone of another person. Think about it... When you go to a doctor with a medical problem, do you want the doctor to give you generic advice, or give you the same medicine he gave to the person before who likely has a totally different problem and medical history than you do? Don't you want, expect and deserve an individual diagnosis and treatment that is based only on YOUR problem, YOUR medical history and anything else that is specific to YOU? Think about what would happen to your health if you didn't get that. Or think about this: If you hire a personal fitness trainer to help you lose 80 pounds, do you want him to give you the same workout schedule that he gave to another person who needs to lose only 15 pounds? If you were 80 pounds overweight, you would have a completely different set of physical challenges, needs and levels of endurance compared to someone who only needs to lose 15 pounds. You would need a workout and nutrition plan that is specific to you, your situation and how much you can handle right now. You are an INDIVIDUAL with your own special sets of, needs, goals, and obstacles to overcome in order to become the guitar player you want to be. That means your guitar practice schedule must be designed around YOU and you only. 3. I can create the best guitar practice schedule myself. False! Unless you have consistently trained other people to become great guitar players you probably aren't going to be able to design effective guitar practice schedules for yourself. More importantly, you need your practice schedule to evolve as your needs, goals and skill level evolve, so you would need to not only have the ability to design 'one' effective schedule for yourself, but many different ones over the next several months or years. To make real (and rapid) progress in your guitar playing, you need to practice differently today than you did last month. Another month from now you will again need to practice in a (at least slightly) different way than you are doing now. These small evolving changes are what you need to maximize your practicing. To do this, you need a series of highly effective guitar practice schedules that change as you change. 4. Guitar practice schedules are boring and hard to stick with. False! Only 'boring' schedules are 'boring' and hard to stick with. Fact is, highly effective guitar practice schedules are never boring, they are fun. Some people think that a 'practice schedule' is a list of the same things you should practice every day. You should NOT practice the same things every day! Doing so will actually hurt your development as a guitar player. The best guitar practice routines are designed as 'multi-day routines' with the perfect balance of variety. 5. Guitar practice schedules can probably make only a small difference in my improvement as a guitar player, not a big one. False! When you use a highly effective guitar practice routine that is designed for you (and only you), it can make a huge and rapid difference in your improvement as a guitar player. 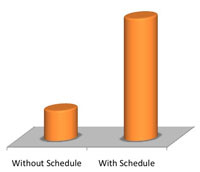 Look at the dramatic differences guitar players experience between having a highly effective goal-driven guitar practice schedule versus having an ineffective general schedule or no schedule at all. Guitar players who use a highly effective, goal-oriented guitar practice schedule improve their overall guitar playing up to an astounding 407% compared to most other guitar players who don't use a highly effective, goal-oriented guitar practice schedule! On average, guitar players who do not have a highly effective goal-oriented guitar practice schedule spend (waste) 59% of their overall guitar practice time on things that are not directly related to reaching one's specific musical goals. 98,3% of guitar players who do not have a highly effective guitar practice routine fail to ever reach their ultimate guitar playing goals. * Results based upon two commissioned studies. It is clear to you now that having a highly effective guitar practice schedule is critical to reaching your musical goals. There are two ways you can get the highly effective guitar practice schedules you need to begin to make more rapid progress in your guitar playing. STEP 1: Commit yourself to creating a truly personalized and customized guitar practice schedule. Avoid using 'pre-made' cookie cutter or general schedules that are not specific to you. STEP 2: Create a routine that is big enough to include all items that you need to practice in order to reach your short and long term goals. To do this effectively, you will need to know how to distribute each of those many practice items across many days. In other words, do not create a one - day schedule that you repeat each day, but instead a 5-10 day schedule that is effective, flexible and correctly distributes those items over several days for maximum results. STEP 4: Learn to fully understand the different separate strategies to reach short and long term goals through practice time in a guitar practice routine. Then build your customized practice schedules to implement those different strategies for each item on your schedule as it pertains to each type of goal you have. STEP 6: Know how to correctly and effectively balance the urgency of wanting to improve something and your quest to reach your short and long term goals. An item which you feel is 'urgent' to learn and master may be part of your short term goals. Other times it will really be part of your long term goals. Yet other times it may be part of both, or neither. So in each of these cases you need to create the schedule differently for that item. STEP 7: Figure out how to harness the strengths of your 'personality type' so that your guitar practice schedules take this into account. More importantly, you must avoid letting any weaknesses of your personality type (every personality type has strengths and weaknesses) influence your practicing in a negative way whenever possible. Your schedule should help you to avoid this so that you make the maximum amount of progress as a guitar player from your practice time. STEP 8: Next, after you've created your new guitar practice routine, it is important to use some kind of automated 'timer' that will keep track of your practice time for each item for you and tell you when it is time to move on to the next item in your schedule. Using an automated timer like this will ensure you stay on course easily and accurately. STEP 9: You need to track every minute of every item that you practice in a log. This is important for many reasons. 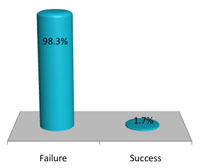 One of these reasons is to monitor progress. Another reason is to track any items that you may have missed (or not completed) practicing on a previous day so that you always know what items you may need to go back to and practice. Both are critical contributors to your guitar playing success. STEP 10: The final step - and one of the most important - is to repeat steps 1-9 every 1-2 weeks. Yes, that's right, you need to create new guitar practice schedules on a regular basis. Why? Because your skill levels, musical goals and challenges will naturally evolve as you improve as a guitar player. Therefore, what and how you practiced last month will NOT be the most effective way for you to practice this month. Your practice routines must evolve as your playing evolves, each time taking into account the above mentioned factors! Obviously, figuring out how to correctly do all those steps on a regular basis is extremely difficult, daunting and time-consuming even if you have a LOT of experience as guitar player or guitar teacher. If you don’t have the time, expertise and motivation to do it yourself, the second approach is much easier: Get the only tool that does all the hard parts for you. After 20 years of teaching guitar and getting DAILY emails from guitar students from all over the world asking about how to practice guitar, I put together a very special tool that gives you the perfect personalized, custom-made, goal-driven highly effective guitar practice schedules (this is not guitar lessons) that enable you to improve your skills as a guitar player much easier, faster and better than ever before: The Practice Generator. Include the list of things you need to practice in order to reach your short and long term goals. These unique multi-day routines are proven and flexible enough to be more effective than daily or weekly schedules. Will consistently, automatically and accurately take into account your current level of skill and knowledge for each individual item you need to practice. This ensures that the guitar practice schedules you get will always be personalized to YOU, YOUR skills and YOUR knowledge. This is critically important in order for you to get the most from your practicing. Give you all the things that you would normally have to do on your own in the 10 steps mentioned above. Getting all 10 of those things will make your guitar playing, guitar practicing and your life a lot easier, better and fun. Will help you to be one of the 1.7% of guitar students who actually do reach their guitar playing goals because they use highly effective guitar practice schedules over the long term. 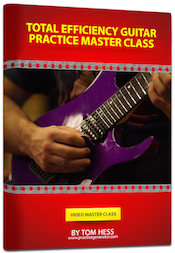 Will give you faster RESULTS by organizing, optimizing and maximizing every minute of your guitar practice time. Will save you A LOT of time. and got that much benefit? Master the music you are practicing a lot faster and easier. Avoid crippling bad habits that hold you back and keep you frustrated & stuck. Enjoy the process of becoming a great musician. Make rapid progress in your guitar playing even if your practice time is very limited. Develop confidence in your potential to become the guitarist you want to be and increase your motivation to practice guitar. This is why I'm giving you my Total Efficiency Guitar Practice Video Master Class that teaches you to practice guitar the right way and helps you get greater results from the practice schedules the Practice Generator creates for you. This massive master class is broken up into 5 parts (you receive 1 part per month as you continue to use the Practice Generator). This helps you to fully absorb the strategies I teach and train you to use and ensures your rapid progress. Total Efficiency Guitar Practice Master Class - Part 1: Learn about the biggest killers of your guitar playing progress, how they affect your playing (in the short and long term) and how to overcome them to make your guitar playing improve quickly. These strategies are very simple to implement, they apply to you no matter your style or skill level and they speed up your progress even if your guitar practice time is very limited. Total Efficiency Guitar Practice Master Class - Part 2: Learn to use rotating laser guitar practice techniques to pinpoint the exact causes of your guitar playing challenges and eliminate them forever. These strategies help you prevent overwhelm from having too much to focus on and make your brain run like a super computer that trains your hands to master the guitar. Also discover why “being a perfectionist” slows down your progress and what great guitar players really think about when they practice to achieve huge results. Total Efficiency Guitar Practice Master Class - Part 3: Learn how to always know what to focus on when you practice guitar, to avoid wasting time on things that don’t make you better. Also learn how to overcome deeply-rooted bad habits in your guitar technique without putting your guitar playing on hold. This helps you improve faster and makes your guitar practice a lot more fun. Discover why practicing guitar using the Geometric Approach TM helps you progress much faster than the inferior linear approach. Total Efficiency Guitar Practice Master Class - Part 4: Learn why tracking your musical progress puts your guitar playing on steroids and helps you reach your goals much faster than the average guitar player. Understand the difference between maximum guitar speed, guitar speed consistency, 2-hand synchronization top speed and top speed of clean playing and how to master each area to make fast guitar playing feel very easy. Total Efficiency Guitar Practice Master Class - Part 5: Learn why integration of your musical skills is the Holy Grail of effective guitar practice and how to develop it the right way. Most guitarists confuse integration with application and end up with lots of skills they cannot use when it really matters most. More guitar practice doesn't solve this problem - training for fluency and real-life playing does. Learn how the pros practice guitar to make their playing consistent, reliable and accurate, even on their worst days. These skills help you reach your musical goals quickly. OK, so now it's up to you... You can make a huge positive change in your guitar playing life... Or you can do things the same way you've always done it - keep struggling, complaining and hoping that some day a miracle will change things for you. You might be thinking that the world's most advanced, most powerful and most innovative guitar practicing tool must be very complicated to use. The Practice Generator is actually very simple to use because I'm going to give you easy-to-follow step by step instructions to get you started right away. You need it. You want it. You deserve it. The Practice Generator creates a schedule for you that tells you how much time you have to spend on each element. This is EXTREMELY invaluable because it takes out all the thinking from the process. You just need to know where you are, where you want to be and the Practice Generator tells you how much you need to practice each element, what day and with what frequency. This helped me immensely. It's like night and day. Before I was practicing a lot of course, but the results came very slowly. After using the Practice Generator, everything came way faster because my practice was more balanced, following my goals. P.S. Hmmm...still not sure? Here is something you should know... Guitar players who use a highly effective, goal-oriented guitar practice schedule improve their overall guitar playing up to an astounding 407% compared to most other guitar players who don't use a highly effective, goal-oriented guitar practice schedule! I tend to be one of those people that feels the need to completely master something before I move on to something else, and historically, that has inhibited my progress. With the Practice Generator, I can structure my lesson time in a more reasonable fashion so that I can still work on material I have not yet mastered, without it being at the expense of my other lesson material. I think this tool has helped me improve immensely, because I am able to be more efficient when I practice.